For those who want cool, refreshing, odorless ice to cool their drinks, we recommend the Scotsman ice crafted by the Scotsman Undercounter Essential Ice Machine. The Scotsman company has been making ice for more than fifty years, crafting cubed ice makers, flaked ice makers, and nugget ice makers. We will discuss the particular qualities of different models of the Scotsman Undercounter Essential Ice Machine and then compare the qualities of one model to those of other ice makers. What Is The Scotsman Undercounter Essential Ice Machine? The Scotsman Undercounter Essential Ice Machine is a machine that makes and stores ice. There are models of this machine for cubed ice, for nugget ice, and for flaked ice. The models that will be discussed have all been manufactured in the United States. The UF424, UN324, CU0290, and CU0415 models of the Scotsman Undercounter Essential Ice Machine have a 3-year warranty on parts and labor. They have a slide back door that allows for easy access to the ice and a control panel for operating the machine. They meet the low lead requirements of the US Safe Drinking Act and use the R-134a refrigerant that does not deplete the ozone. 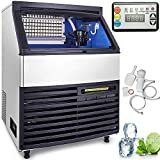 The UF424 Essential Ice Undercounter model of this machine makes flaked ice and comes with a power cord, an ice scoop, and an external air filter to make cleaning the filter easy. It includes a stainless steel evaporator to achieve the most durability and a QR code specific to the unit that makes the product's service manuals and warranty history easily available. It also features greaseless bearings that do not have to be maintained and help the machine to last for a long time. With air and water condensers, this model can produce 440 lb. of ice in a day at 70 degrees Fahrenheit for the air condenser and 90 degrees Fahrenheit for the water condenser. The machine can store 80 lb. of ice and is 24'' wide and 39'' high - perfect for fitting into tight spaces. It also includes an optional floor mount kit by which the height can be lowered to 33.5''. It uses 12.0 gallons of water and 4.6-kilowatt-hours of energy for every 100 lb. of ice produced. The UN324 Essential Ice Undercounter model of this machine makes nugget ice. It shares some features with the UF424 model such as an external air filter, a power cord, an ice scoop, a stainless steel evaporator, a QR unit specific code, and greaseless bearings. Like the UF424 model, the UN324 model has a width of 24'' and a height of 39'' that, with an optional floor mount kit, can be lowered to 33.5''. This model will produce 340 lb. of ice in a day at 70 degrees Fahrenheit for the air condenser and 50 degrees Fahrenheit for the water condenser. Like the UF424 model, it also can store 80 lb. of ice. In addition, 12.0 gallons of water and 5.47-kilowatt hours of energy allows this machine to produce 100 lbs. of ice. The CU0715 Essential Ice model makes cubed Scotsman ice and has an air condenser. It is 15'' wide and 38'' high and includes an optional floor mount kit that can lower the height to make the machine fit under countertops that are 34'' high. It can store 80 lb. at 70 degrees Fahrenheit and 58 lb. at 90 degrees Fahrenheit. It can store 36 lb. of ice. This machine requires 30 gallons of water and 11-kilowatt hours of energy to produce 100 lb. of ice. The CU0415 Essential Ice model makes cubed Scotsman ice. It is 15'' wide and 38'' high. It has an optional floor mount kit that can lower the machine to where it can fit under counters that are 34'' high. It will produce 58 lb. of ice at 70 degrees Fahrenheit with the air condenser and can store 36 lb. of ice. In addition, 41 gallons of water and 12-kilowatt hours of energy with this machine will produce 100 lb. of ice. The CU0920 Essential Ice model is 20'' wide and 38'' high. Like the CU0715 and CU0920 models, it has an optional floor mount kit that can lower the height to fit under countertops that are 34'' high. This model can produce 100 lb. of ice at 70 degrees Fahrenheit and 80 lb. of ice at 90 degrees Fahrenheit. In addition, it can store 58 lb. of ice and requires 35 gallons of water and 10-kilowatt hours of energy to produce 100 lb. of ice. Depending on the condenser and voltage, the price for the UF424 model can range from around $8,431 to $8,681 while the price for the UF324 model can range from around $8,601 to $8,851. The CU0715 model's price ranges from approximately $3,960 to $4,110 while the price of the CU0920 model approximately ranges from $4,226 to $4,376. The CU0415 model has ranged in price from $3,598 to $3,748. 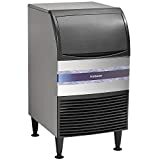 We recommend purchasing your ice machine at the Amazon links below. Purchasing from Amazon is ideal for the customer service, quality products, and reliable shipping. The sliding door allows easy access to ice, but it may not be able to be used in sunlight. This machine needs to be professionally installed. The design is suitable for storage and for fitting in small places, making it useful. A 3-year warranty for labor and the parts is sufficient for this product. The EdgeStar IB120SS Built in Ice Maker makes crescent-shaped ice cubes and has a stainless steel door on a black body. It is 25 1/4'' in height, which makes it fit ADA height regulations, 15'' in width, and 54 lb. in weight. It features front venting for both built-in and freestanding installation and does not require a drain line. Unlike the Scotsman CU415MA-1A Essential Series Ice Maker, this machine can operate as a freezer as well. It will produce 12 lb. of ice in a day and can store 6 lb. of ice. It will automatically shut off making ice when the bin is full. It also includes a reversible door and can be used in outdoor locations such as an outdoor kitchen. It can be used in outdoor locations and does not require a drain line. This machine can be installed by a licensed plumber. It is easy to find a place to fit this machine in and to install it. The warranty does not cover outdoor installation. 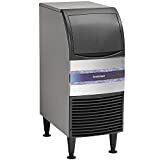 The Costway Commercial Ice Maker can make 88 lb. of cubed ice in a day and store up to 8.8 lb. of ice. It will show when more water needs to be filled and stop making ice when the ice bin is full. It includes an ice scoop, user-friendly smart panel, water line with a filter that connects to the faucet, and pipe for draining water. It can be built-in or freestanding and is self-cleaning. It weighs 40 lb. and is 13'' in width and 23.5'' in height. With the ice scoop, the price will be approximately $344.73. The smart panel helps the user to operate the machine. Minimal assembly is required as the only thing that has to be installed is the pipe. It is small enough to fit in small places, yet big enough to store a suitable amount of ice. 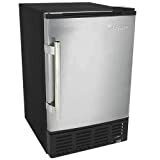 The Vevor 110V Commercial Ice Maker will most likely make 286 lb. of cubed ice in a day if kept under 5 degrees Celsius and can store 99 lb. of ice. The thickness of the ice being produced can be adjusted with thin ice taking 5 to 8 minutes, ice is between thin and thick taking 8 to 11 minutes, with thick ice taking 11 to 15 minutes. This machine can operate freestanding or built-in. Like the Costway Commercial Ice Maker, this machine also features a smart panel. Ice can be made at a reserved time in advance up to 5 hours. It will insulate heat for 5 to 7 hours if the power fails. The machine includes a nano antibacterial liner and dry filter to prevent bacteria from growing. The machine will automatically clean itself with one button. It weighs 121 lb. and is 26.5'' wide and 32.6'' high. 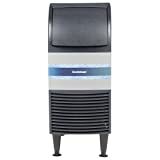 This ice maker is more expensive than the Costway and EdgeStar ice makers. The machine includes a smart panel and allows for ice thickness to be adjusted. It does not require a drain pump. The design enables heat insulation if the power fails and adjustment of ice thickness. We did not find warranty information on the Amazon website link. From our review, our favorite ice machine is the Scotsman CU0415MA-1A Essential Series Ice Maker. While each of these ice machines is high-quality and will make a great ice machine for you, the Scotsman machine gets our vote for its design quality, versatility, ability to fit in small spaces, and helpful features. Regardless of the ice machine you prefer, we hope this review helps you find exactly what you are looking for. Overall, we consider the Scotsman CU0415MA-1A Essential Series Ice Maker to be a competent ice-making machine. 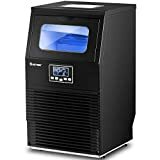 Its sufficient warranty and ice-producing ability are among its merits, while the fact it does not produce as much ice as the VEVOR ice maker takes away from its impressiveness. However, we still find this machine high-quality and well worth your investment. What are you waiting for? Purchase your new Scotsman Essential Series Ice Maker today! We trust you will not regret it.